On Saturday, October 31st, the Economist released their inaugural Global Diversity List, highlighting companies, campaigns, and individuals dedicated to diversity in their respective industries. There are eight categories in total, highlighting champions, networks, and initiatives that focus on diversity across ethnicity, gender, sexual orientation, and disability, all of which have been nominated by the readers of the Economist, and then approved by an independent panel of experts. Going forward, the Global Diversity List aims to be an annual publication, with the goal of recognizing and supporting those at the forefront of diversity initiatives worldwide. This is the first time a comprehensive list of champions of diversity has been compiled in such a manner, and the ambition of this initiative is bold. As Mark Palmer-Edgecumbe, CEO of the Global Diversity List, states, “The list marks a seminal moment for the diversity profession, by publicly recognising the world’s most influential, innovative and creative diversity professionals in one comprehensive list for the first time. The list sets the benchmark of exceptional performance in the profession today and creates the role models for the diversity professionals of tomorrow”. The Global Diversity List was published last Saturday, and on the following Sunday morning, I awoke to a tweet informing me that I had been selected as one of the Top 50 Diversity Figures in Public Life. While my inclusion on this list has come as a complete shock and surprise, I am incredibly honored and humbled to be named alongside so many accomplished individuals including Christiane Amanpour, Angelia Jolie, Hillary Clinton, Bill Gates, Phumzile-Miambo-Ngcuka, Michelle Obama, Malala Yousafzai, and more. I certainly do not take this recognition lightly, and I know that this award will only harden my resolve to keep working towards greater gender parity, and to use all of my available resources to keep pushing our world towards what I know will be a better tomorrow. I’m sure all of my fellow nominees feel the same. Diversity is so much more than just a buzzword or the flavor of the month. It is the way forward. It is the only way to ensure that all voices are given the opportunity to be heard, and to account for the countless unique viewpoints that exist in the world. My life’s passion may be to advocate on behalf of women and girls, but there are so many other marginalized voices that need to be heard as well, and it is precisely for this reason that the Global Diversity List is so important. It is recognizing those who are advocating for diversity across a broad spectrum of communities, and seeing as this is only its inaugural year, this is a platform whose potential to influence change can only grow as the years pass. I, for one, am thrilled to be a part of it, and I will not waste this extraordinary opportunity. Although, I must admit, at the moment, I am still trying to process that tweet I first read last Sunday morning. So for now, I extend a most heartfelt thank you to the Global Diversity List and the readers of the Economist. Tomorrow, I get back to work. 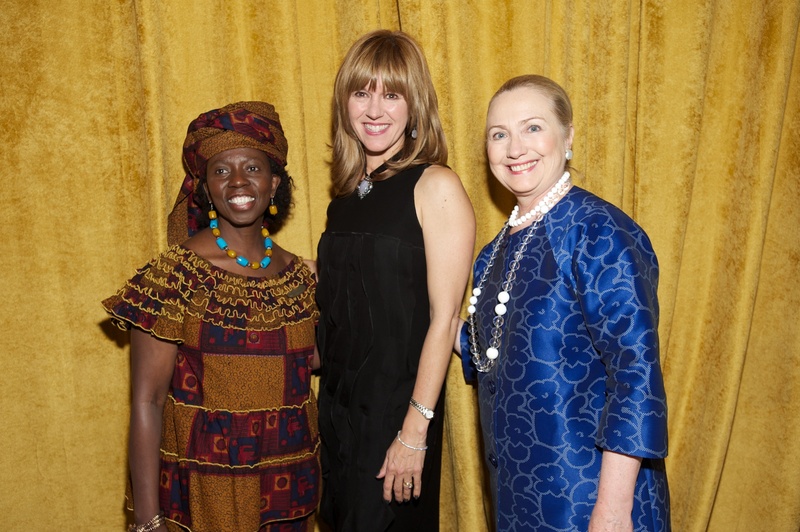 Photo is with Hillary Clinton – Former Secretary of State and Presidential Candidate, and Musimbi Kanyoro – President and CEO of the Global Fund for Women, at their 2013 Dinner. Congratulations on this incredible recognition! I’m very happy for you and know that even with all the success you’ve accomplished in the women’s philanthropic movement, your commitment ensures much more will follow. I corrected the website address.